Jan Jahnel RN, CNRN is the Stroke Nurse Coordinator for the INI Stroke Center and INI Stroke Network at OSF Saint Francis Medical Center in Peoria, Illinois. Jan has 14 years of neuroscience nursing experience with the last five years focusing on stroke processes and care. Her commitment and dedication has been an important part of Stroke Camp. She works very closely with Retreat and Refresh Stroke Camp, attending many weekend camps, helping with some of our fund raisers, and providing us with technical knowledge about strokes. The diagnosis we're covering here is that which comes after the stroke survivor has entered the hospital. I am assuming you already know the F.A.S.T. and the "Give Me 5" method from Part 1 for telling if someone is experiencing a stroke and that you have rushed immediately to the hospital within three hours of the first symptom. Once in the hospital, it is critical for the medical personnel on site to diagnose the stroke in progress. Timing is very important. Time lost is brain lost!! That is why timing is so important. Time lost is brain lost. It is important to quickly recognize, diagnose and treat the stroke while it is happening. assess for narrowing of the neck vessels. problems with the heart or poor pumping action. image is used to diagnose small deep injuries. Penumbra device- FDA approved device: a catheter with a separator and a vacuum that separates the clot into small pieces that are then vacuumed into the catheter. Intra-arterial t-PA: t-PA is injected directly at the site of the clot. This also involves taking the person to have an angiography. The catheter is threaded up to the clot site and the medicine is injected directly at the clot. The only FDA approved acute drug treatment for an ischemic stroke is IV t-pa (ischemic stroke are those strokes caused from a blocked vessel). Time is also important for determining treatment for strokes. This drug must be given within 180 minutes of symptom onset. Symptom onset is the last known time the person was “normal”. This means the person must get to the hospital, obtain a CT scan and have the medication available. Strict guidelines are used to decide if a patient qualifies for this treatment. Many factors may disqualify a patient from receiving this treatment. It cannot be given to everyone, especially for hemorrhagic strokes, (those strokes caused from bleeding into the brain.) Complications with IV t-pa include hemorrhage in the brain so patients receiving IV t-pa will be in the ICU for at least 24 hours with hourly assessments. 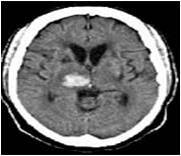 Intracerebral hemorrhage-There is no approved acute drug treatment for a hemorrhage in the brain. The doctors will want to keep the blood pressure controlled and not let it get too high. They may administer blood products such as plasma or platelets to help the blood clot especially for those on any type of blood thinners. Surgery or catheters (Ventriculostomy) may be used to drain or remove fluid and blood from the brain. Endovascular Coiling - A tiny catheter is threaded from the groin artery up into the brain artery and into the aneurysm. Tiny platinum coils are released into the aneurysm to seal it off. Endovascular treatment originated in the 1980’s by an Italian physician Dr. Gugleilmi. With the origination of this new treatment some patients who were told the aneurysm was inoperable now have hope for a treatment. Other patients because of advanced age, medical condition, or other factors who could not tolerate open brain surgery this could be an alternative to their treatment. Clipping - Surgical Clipping is still the most common surgical treatment for brain aneurysms. This requires general anesthesia, incision into the skull and removal of a section of bone. Under a microscope the aneurysm is carefully separated from the normal blood vessel, it is then clipped with a tiny clip somewhat like a clothespin. With the clip in place no more blood can enter the aneurysm. That's it for Part 2. I hope this was not too technical, but I did find it interesting and thought it was worth passing on to you. Next, in Part 3, I'll cover what the stroke survivor can expect from the Brain Attack and what will happen after being admitted to the hospital. I have been a caregiver for my husband, John, who had a stroke over ten years ago, but recently, through unfortunate circumstances, I was reminded of the things a caregiver learns as they navigate the early years following a stroke. This reminder came after my brother’s wife had a massive stroke. While he was getting through the first few months, he leaned on me as the “stroke expert” asking questions almost daily. As a caregiver for my husband, John, I realized we were settled in a rhythm and I had forgotten all the ways that we adapted after his stroke. I’ve worked with many stroke survivors and caregivers as executive director of Retreat & Refresh Stroke Camp, so decided to do my “Top Ten List” for new caregivers. Although each stroke is different, whether it is one month or ten years post-stroke, these are some things I personally have found to be true. Routine is your new best friend. Give your survivor adequate information about any changes as soon as possible. Don’t try to reason with a survivor having a melt down. They are simply not able to be rational in the moment. Remember it’s the stroke, not you that makes them angry or sad. Always, I said always, keep calm in a crisis. Deep breathe and count to 10 (or 100 if necessary). Don’t take the exit of friends and family personally. It is their issue, not yours. Slow down and repeat things with great regularity. Look at your survivor when talking with them (whether or not they have aphasia, they may have memory and cognitive challenges that require more attention to the conversation). Encourage your survivor to get as involved as possible in decisions involving their care or family situations. They still need a voice and to feel they are a part of life’s decisions. Find your “new normal” and seek a few things that you both enjoy and then participate. (Go to the mall and walk or wheel around, get a bite to eat or a gourmet coffee, watch the people, then go home and rest. Attend reasonably priced community theater, go to a park and watch the people as you feel the wind on your cheeks. Sit on the front porch rather than in the house, go to a support group, volunteer both of you or even independently to do something for someone else). Accept that it is unlikely you will ever have a normal “marital” or “family” disagreement that will be resolved in the moment. Things that need to be addressed or changed will better come through planned discussions, one topic at a time. Never ever give up because there can be progress even many years after a stroke. The progress may not be dramatic, but it’s there. I hope you find some of these tips helpful on your own personal journey following a loved one’s stroke. Marylee Nunley, Executive Director, Retreat & Refresh Stroke Camp and wife of John Nunley, survivor since 2001. Jan Jahnel RN, CNRN is the Stroke Nurse Coordinator for the INI Stroke Center and INI Stroke Network at OSF Saint Francis Medical Center in Peoria, Illinois. Jan has 14 years of neuroscience nursing experience with the last five years focusing on stroke processes and care. Her commitment and dedication has been an important part of Stroke Camp. She works very closely with Retreat and Refresh Stroke Camp, attending many weekend camps, helping with some of our fund raisers and providing us with technical knowledge of stroke. 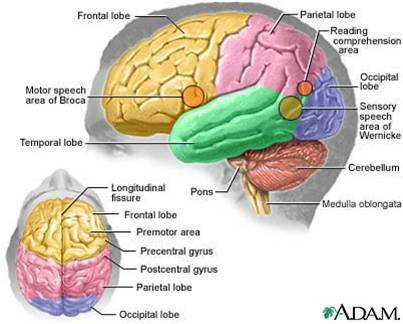 In this picture you can see the different lobes of the brain. It also shows some important areas within those lobes, such as speech areas, vision areas, and areas for reading and comprehension. Damage to these specific areas will result in difficulty with speaking, understanding what is being spoken, problems with vision, and balance. The left side of the brain controls the right side of the body, language centers and logical thinking. The right side of the brain controls the left side of the body, recognition and sensory/spatial perception. With the brain, the right side of the brain controls the left side of the body and vice versa. The right side of the body (arm and leg ) will be affected with a left sided stroke. The left side of your brain also controls logical thinking and your language. The right side of the brain is responsible for vision and recognition. It also controls the movement and sensation of the left leg and arm. The brain is a very complex and important organ. Any interruption to the normal functioning of the brain can cause many problems. Strokes happen in the brain. The “Brain attack” term is used to show that a stroke is as serious as a heart attack. Lack of blood supply to the brain results in damage to the brain tissue causing injury to the brain. Without adequate blood supply the brain tissue dies. Stroke symptoms will depend on the size of the stroke, the location and vessel in the brain that is injured. There are two types of strokes. If you think about stroke as a plumbing problem an ischemic stroke occurs when the pipe gets clogged and a hemorrhagic stroke occurs when the pipe bursts. 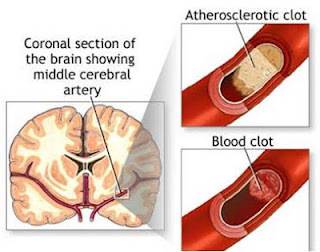 A blood clot that travels to the brain is called an embolic stroke. 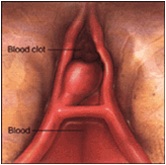 These are usually caused by a wandering blood clot, usually from the heart or the neck vessels. Atrial Fibrillation( which is an irregular heartbeat) or a PFO ( which is a small hole between the chambers of the heart) may be the reason these clots form and are carried in the blood stream, clogging the vessels leading to the brain. 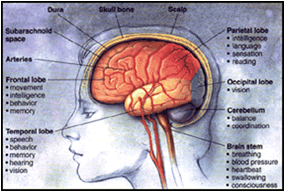 When this happens blood supply to that area of the brain is cut off and brain injury occurs. Another type of stroke is called a hemorrhagic stroke. This is when the pipe or vessel bursts and blood is spilled into the brain. This is a CAT scan picture of bleeding into the brain. The white area shows where the bleeding has occurred. 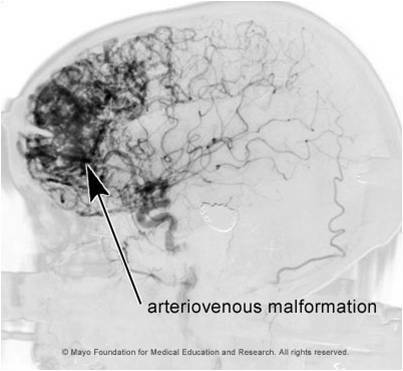 An arteriovenous malformation is an abnormal cluster of arteries and veins all tangled together. These tangled vessels in the brain can rupture and bleed, causing a stroke. An aneurysm may happen in an area of the vessel where it splits….kind of like a T in the road. The blood vessel weakens and the vessel wall balloons at the split. The aneurysm can grow very large. The walls of the aneurysm become very thin and finally ruptures spilling blood into the brain. This is called a subarachnoid hemorrhage. I hope this gives you a little insight of what a stroke is and a little idea of what the brain looks like and its many functions. In the near future I will be covering other topics such as some diagnostic tests stroke survivors will experience in the hospital and different types of treatments while there, what stroke survivors may expect while in the hospital and later when released, managing risk factors, rehabilitation, and what support is available after the survivor has been released from the hospital. Retreat and Refresh Stroke Camp recently completed its fourth year of doing stroke education in fifth grade classes in and around Peoria, IL. This year we visited nine schools and spoke to 25 classrooms. That is a total of about 650 fith grade students and teachers who now know more about stroke than the average American does! The classes run between 45 minutes and an hour each and have multiple components. We start by introducing everyone - nurses, students, stroke survivors/caregivers, etc... Then we ask how many of the students know someone who has had a stroke. You would be shocked by the number of hands that go up! Many of the students have stories to tell about how their grandma/pa, aunt, uncle, etc... who have had strokes. However, not many students know the warning signs and symptoms of a stroke. That's where our nurse/s or nursing students come in! They teach the students about what a stroke is, the different kinds of stroke, and two different ways to tell if a person is having a stroke. Do you know all the warning signs and symptoms?? 1. Walk - Can the person walk? Do they walk funny or stumble? mumble or talk gibberish? Do they have slurred speech? 3. Reach - Are they able to reach up with both arms and hold both arms up for 10 seconds? Does one arm start to drift downward? 4. See - Do they have double vision? Do they have tunnel vision? Can they only see on one side? worst headache of their lives? F - Face-ask the person to smile. Do both sides of their mouth go up? Or does one side droop? understand what you are asking them to do? hope it will get better and don't wait to call the doctor. They need immediate medical attention. Time Lost = Brain Lost. We emphasize with the students that a stroke can happen to anyone at any age of any race or ethnicity, although the risk increases with age. Then we have our stroke survivor and/or caregiver tell his/her stroke story. The students always have some really great questions for them. A common question is: What does it feel like to have a stroke? After that, the students each participate in one disability simulation where they have to complete a task using only their non-dominate hand. Tasks include things such as putting on and fastening a belt, putting on and buttoning a button down shirt, putting on a sock and shoe and tying the shoe, folding laundry, packing a book bag for school and zipping it, etc... The students learn very quickly that completing these tasks with only one hand takes longer than usual and they have to be creative (adapt) in order to be successful. The take home message is that stroke survivors are not dumb and they are not stupid! They just might be slower at things because the stroke has effected their brain and possibly their motor coordination. Collin Stratton's runner-up poster from Peoria Christian Middle School. We also teach them about prevention: eat healthy, exercise, and DON'T SMOKE! Each student is given a poster and is instructed to create an educational poster about stroke. We judge based on content, accuracy (spelling counts! ), neatness, and creativity. Our panel of judges selects the top three posters from each class and those students each get a gift card to Wal-Mart (a big thank you to the Pilot Club of Peoria for donating toward the gift cards). The grand prize winner gets to ride in the Life Flight helicopter and land in center field at the Peoria Chiefs game on our Strike Out Stroke day-June 10, 2012!!! All winning posters will be displayed on the O'Brien Field walls at the game on the 10th. We would like to thank the Illinois Neurological Institute, in particular nurses Jan Jahnel and Teresa Swanson-Devlin for helping with and sponsoring these education classes since their inception. We would also like to thank Jordan Jason and Kendra Zerwekh, students from the Methodist College of Nursing, who helped at some of the schools this year. Without the assistance of INI and Methodist, these classes would not be possible.